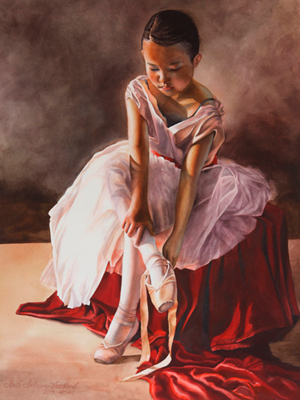 Go to the Painting Gallery to see submitted paintings from the Paint the Ballet project. Ballet has a rich tradition in the visual arts, but access to the subject by the fine artist is rare. Paint the Ballet was founded by New Mexico painter John Meister and developed purposefully to promote awareness and increase visibility of both the painters and the ballet. In 2013, a group of painters who were interested in painting the theme of ballet were invited to join the Paint the Ballet project, a cooperative arts endeavor that was imagined after seeing a fundraising performance by dancers of the New Mexico Ballet Company (NMBC). While envisioned as a one-time event with about ten artists participating, the project grew to nearly forty artists by the end of its first year. Paint the Ballet begins its second year with roughly 36 painters participating in the project, representing oil, watercolor, pastel, acrylic, and other art media. They work with the dancers of NMBC and, in exchange for access to the subject and modeling fees, each is given the opportunity to participate in exclusive painting exhibitions for display, sale, or auction. Proceeds of the sales are split between the painter (50%), the Dance Company (40%) and the project (10%). This allows for an ongoing sustainable program. This unique effort allows art to support art, talent to support talent. Click here to read a first-hand account of the project from the dancer's perspective. Featured Painting: Tiny Dancer, by Ruth Andrews Vreeland, watercolor 22"x15"
See more paintings at our Gallery of Paintings. Site design by John Meister, all rights reserved. Painting images used on this site are by permission of the individual artists, who retain all copyright to their images.